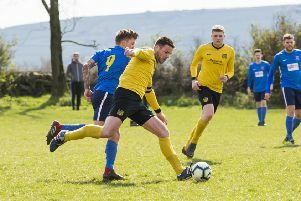 Ryburn United moved through to the semi-finals of the West Riding CAL’s League Cup with a 3-0 home win over Ovenden WR in Saturday’s derby match. They had already notched a league double over their Calderdale rivals but Ovenden gave a much improved performance at Ripponden Wood. For 40 minutes the sides were fairly evenly matched. Ovenden’s Tom Boyle made fine saves from George Turner and Christian Silkstone while Ash Skully was a constant threat to the Ryburn defence but his good approach play failed to produce any goals. Nathan Sloane fired over from 15 yards on the half hour mark but Turner did open the scoring when West Riding lost the ball deep in their own half and a quick one-two resulted in Turner firing past Boyle from 12 yards. The visitors suffered a double blow shortly after the break, the inspirational Greg Porter being forced to leave the field with a calf injury before Silkstone scored from the spot after a hasty Boyle clearance resulted in Jordan Pettifor bringing down Turner. Minutes later Turner added his second after some attractive build up play. West Riding continued to take the game to Ryburn but lacked a killer punch in front of goal.